First published in 1572 and never before translated into English, the first four books of Ronsard’s Franciad are the closest the French Renaissance came to having an epic comparable to Camões’s Lusiads or Ariosto’s Orlando Furioso. The Franciad O tells the story of Francus, the son of Hector and survivor of the Trojan War, to whom Jupiter gives the mission of founding France. "[Usher] brings this work to the English-speaking audience for the first time"
"A handsome volume...." "...a bold undertaking..." "...a lively, perceptive work [that] will introduce many more readers to a major work by Ronsard". --Jean Braybrook (Birbeck, University of London), Modern Language Review, vol. 107, part 3, July 2012, p. 935-36. "This handsome volume presents the first comprehensive English translation of Pierre de Ronsard's famous, unfinished epic poem. [...] Usher here offers his reader a readable and accurate English version [which is both] a vulgarization for the benefit of the non-French reader [and] a work of impressive scholarship. The 65-page introduction provides an excellent overview of both the context and the content of Ronsard's poem. [...] As such, Usher's essay also provides a suggestive introduction to Ronsard studies in general. Finally, it should be noted that the text of the translation is copiously annotated." "This book is a fine contribution to Ronsard studies on many points. 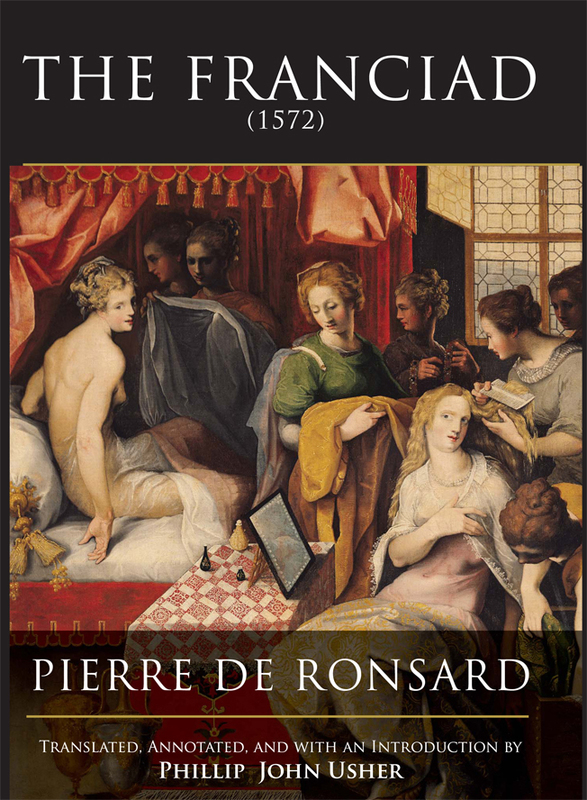 [...] Usher masterfully renders Ronsard's images [...] Usher's excellent notes capture Ronsard's sources [...] Usher's very impressive volume is a firm introduction to Ronsard for students as well as a very significant aid to scholars."